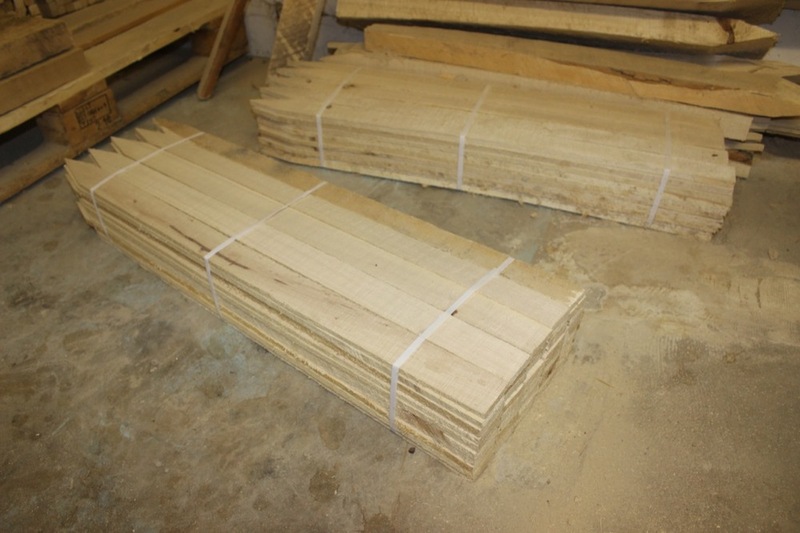 We do custom resawing to manufacture custom pallet parts and rough-cut lumber from various species. 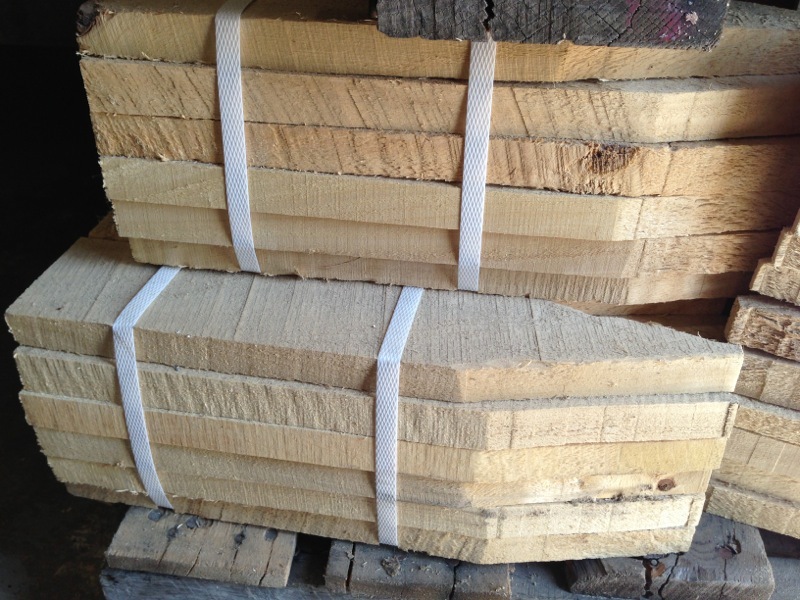 Size: 1 ¼" x 3 ½" x 48"
Stakes available in chisel point and pencil point. All bundles are double banded for easy handling. Made using kiln-dried wood. 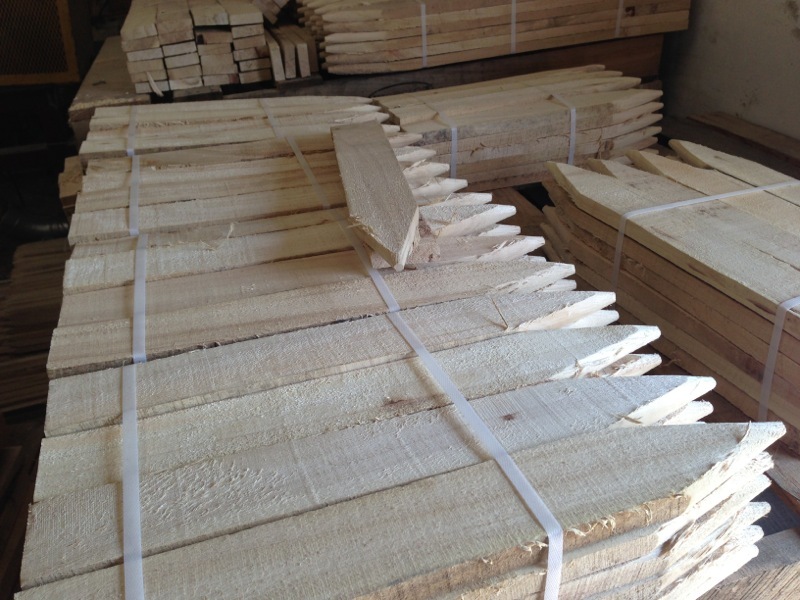 This ensures no cracking or warping, producing harder and more reusable stakes. 1" × 2" × 12" Chisel 24 80 ¾" × 1 ⅞"
1" × 2" × 18" Chisel 24 96 ¾" × 1 ⅞"
1" × 2" × 24" Chisel 24 80 ¾" × 1 ⅞"
1" × 3" × 12" Chisel 24 96 ¾" × 2 ½"
1" × 3" × 16" Chisel 24 80 ¾" × 2 ½"
1" × 3" × 18" Chisel 24 80 ¾" × 2 ½"
1" × 3" × 24" Chisel 24 72 ¾" × 2 ½"
1" × 3" × 30" Chisel 24 40 ¾" × 2 ½"
1" × 3" × 36" Chisel 24 40 ¾" × 2 ½"
1" × 1" × 18" Pencil 36 80 ⅞" × ⅞"
2" × 2" × 8" Pencil 24 50 1 ½" × 1 ½"
2" × 2" × 24" Pencil 24 72 1 ½" × 1 ½"
2" × 2" × 36" Pencil 24 40 1 ½" × 1 ½"
2" × 2" × 48" Pencil 20 39 1 ½" × 1 ½"
Lath available in chisel point only. ½" × 1 ½" × 48" Chisel 50 40 ½" × 1 ½"
½" × 1 ½" × 48" None 50 40 ½" × 1 ½"